Raymond Benjamin is probably the outstanding authority on tax laws in the State of California today. This position is the result of many years of service in the attorney general’s department and as counsel for other departments of the state government. Mr. Benjamin is also nationally known as one of the chieftains of the republican party. He is a native son, born at Vallejo, California, December 14, 1872, son of E. M. and Ruth S. (Mahon) Benjamin. His father is of English and his mother of Scotch-Irish descent. His mother was born in Pennsylvania. E. M. Benjamin, a native of New Jersey, came to California in 1851 by way of Cape Horn. He followed the trade of carpenter in San Francisco, and subsequently became personal representative to Admiral Farragut, who was commander of the Mare Island Navy Yard in the early days. Admiral Farragut owned considerable property in Vallejo, constructing many buildings there, Mr. Benjamin being his business manager and holding power of attorney in managing this property. Raymond Benjamin was educated in public schools in California. His law studies carried on in the offices of Estee, Fitzgerald & Miller, a firm of distinguished men in the professional and public life of the state. John H. Miller, of this firm, was an eminent patent lawyer. Morris N. Estee was a jurist and twice candidate for governor on the republican ticket. William F. Fitzgerald became attorney general of California and later was elevated to the Supreme bench of the state. Admitted to the California bar in May, 1893, Raymond Benjamin for five years practiced law in Vallejo, and then located at Napa. In 1902 he was elected and in 1906 reelected district attorney in Napa County. Resigning as district attorney in September, 1907, he was made chief deputy to the attorney general of California, a post he held until January 1, 1919, resigning to resume private practice. His offices are in the Chronicle Building at San Francisco. Since 1919 in addition to his private practice he has acted as attorney for the state insurance commissioner. He is also special counsel for the State of California in all tax matters and litigation, conducting all tax litigations, particularly cases involving the application of tax laws to corporations, railroads, banks, power companies and insurance companies. From 1911 to 1920 he also acted as legal advisor to the various state officers and district attorneys and the State Board of Equalization. During the years he was in the office of the attorney general and also since that time he has drawn up many of the laws enacted and placed on the statute books of the state. He was author of the corporation license act law of California, the railroad regulation act of 1909, and also drew up the Panama-Pacific Exposition Commission Bill, the first Alien Land Law Bill of California, the Criminal Syndicalism Bill and the tax assessment act. Much of the tax litigation which he conducted was carried through the courts up to the Supreme Court of the United States, which finally sustained the tax system of California. The principal test case was known as the Pullman Company versus the state of California, and its decision sustained the collection of approximately $35,000,000 yearly by the state. During 1921-22 Mr. Benjamin was special assistant to the attorney general of the United States, resigning that position. His record as a leader in the republican party has been hardly less noteworthy. He was elected chairman of the Republican State Central Committee in September, 1916, and in 1918 was elected chairman of both the Republican State Central Committee and the Executive Committee, being reelected chairman of these committees in 1920. In 1918-21 he served as regional director of the Republican National Committee, with jurisdiction over seven western states. During this time he was assistant to the national chairman, Will H. Hays. During the presidential, senatorial and congressional campaign of 1920 he was in charge of the western headquarters of the national committee, and had personal charge of the campaign of Samuel F. Shortridge for the United States Senate. 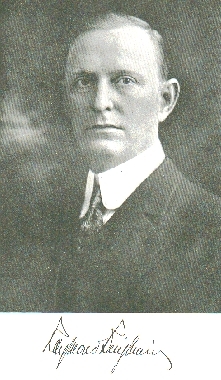 At the time of the National Convention of 1920 Mr. Hays, the national chairman, had with him constantly as his personal staff Mr. Benjamin, Theodore Roosevelt, Jr., L. L. Wadsworth, now assistant secretary of the treasury, and Ralph V. Sollitt, who was assistant chairman of the United States Shipping Board. At the time of the World war Mr. Benjamin registered under the selective draft and was on finance committees during the war drives. He is a member of the San Francisco, California State and American Bar associations. He holds membership in the Elks lodge at Napa, and was grand exalted ruler of the Elks of the United States in 1914-15, and prior to that time for three years had been chairman of the judiciary committee of the national organization. While in that position he redrafted and rewrote many of the laws of the order and prepared an entirely new judicial code, which was enacted in 1913 and has never been changed. He compiled what was then designated and is still known as "The Law of the Elks," a compilation of the opinions and decisions of the highest judicial forums of the national order. Mr. Benjamin is also a thirty-second degree Scottish Rite Mason, being a member of Islam Temple of the Mystic Shrine of San Francisco. He belongs to Napa Parlor of the Native Sons of the Golden West, the Bohemian Club of San Francisco, and the California Society Sons of the American Revolution. At the age of twenty-five Mr. Benjamin was rated as one of the finest violinists in the state, and did concert work, filling engagements up and down the coast. The violin has been a source of great pleasure to him for many years, and he plays it at home, his wife being his accompanist. On May 27, 1902, at Napa, he married Miss Mildred Francis a native of that city. Her father, G. M. Francis, is the dean of the newspaper men of California, having owned and published the Napa Register for fifty-four years. He is one of the well loved men of his county, and has friendships all over the state. Mr. And Mrs. Benjamin have one daughter, Barbara, a graduate of Miss Burke’s School. Source: "The San Francisco Bay Region" Vol. 3 page 346-350 by Bailey Millard. Published by The American Historical Society, Inc. 1924.